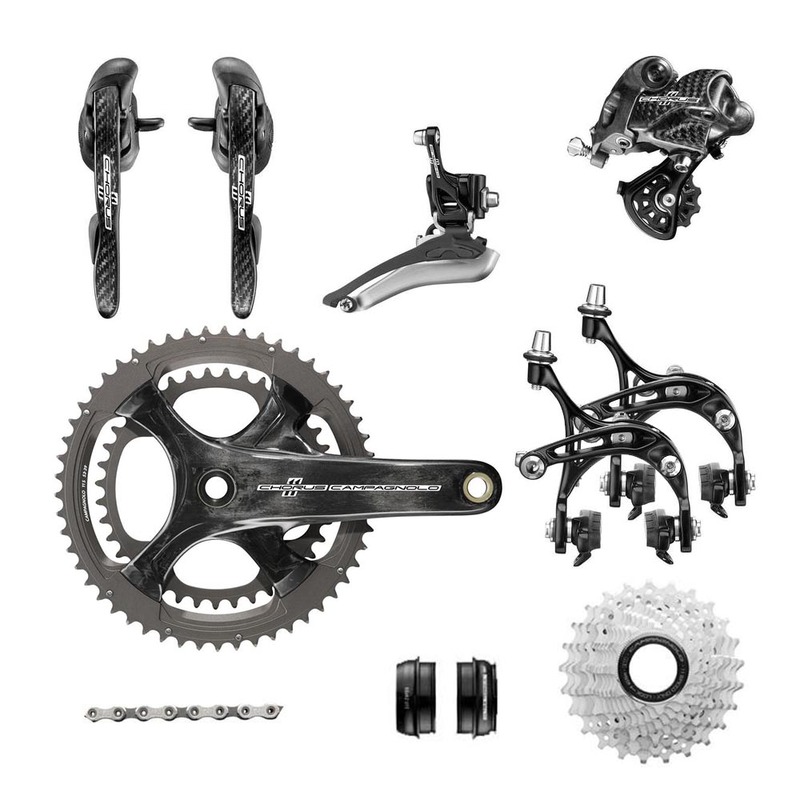 Campagnolo's Chorus 11 speed groupset benefits from many of the same design features of the more expensive Campagnolo Record groupset but at a lower price point. Really pleased with all aspects of how this beautiful groupset works. The shifting precision is a definite step up from the Athena that it replaces; a very positive click, more like the Campagnolo of old. The braking is as good as dual pivots get. Impressed too with the way Merlin allowed me to specify any permutation of cassette, chainset, rear mech and bottom bracket options. DPD delivery was spot on and the price made it too difficult for me not to buy it! Excellent Product. Super smooth shifting and it looks great on my bike. Chorus has given me a big surprise. I felt I had a better bike. I was using Ultegra 6800, which was of good quality. After two years I still did not like the swinging brake lever which is also a shift lever. Apart from being more safe, Chorus has the following unexpected benefits. 1) Ergo power command control - so comfortable that it makes shifting and braking easier and safer. I think Campagnolo's Ergo power control fits small to medium palms more than Shimano's. 2) Crisp and fast shifting - the action begins as soon as the lever is thrown or the tab pressed. Shifting up or down is faster and more efficient. 3) Braking is soft, light and responsive. 4) The brake pad is easy to clean, and no marks are left on the rim. There is an area for improvement: when hands are in the drop, it is not easy to press the tab to downshift. This is not because my thumb is short, but it is difficult to control from the angle as designed. I hope the tab will become softer after some use. Very happy with this purchase. A lovely bit of kit, however I imagine Tuillio would turn in his grave knowing that the simplicity of the 5 and 6 mm allen key assembly has been replaced by a mixture of Torx 25 and Torx 30.... while mini tools have a torx 25 on them these day...why oh why torx 30 ??? The set up and finish is as you'd expect from a high end Campag groupset, their chains are lovely too, but only with a third party link, not going to pay twice the price of a cassette for their chain too. Yes happy with the gear and Merlin's sales. I own the previous campy chorus group set and comparing it to this new group set I would have to say the performance gain is real. The new crank set is noticeably stiffer when out of the saddle. Shifting is also different from the previous group set, each shift on the rear takes an equal amount of energy to shift and the front derailleur's new long arm brings the chain onto the largest chain ring with ease. The new hoods on the levers have a more comfortable ergonomic feel to them the moment you hold one. I really like the look of campy's high end group sets, the carbon finish and now with this new crank set make this group set luxurious. I went with the 52-36 chain set and 11-29 cassette and I would say its the best all around combination for climbing and flat roads. Great performance to value ratio, highly recommended. All the performance of Campag Record but half the price for a minute weight penalty. Looks great as well. Excellent ordering process, first rate experience. Shipping was very quick to the U.S.A. I would highly recommend Merlin Cycles for any of your cycling needs. Wow!, what a superb experience, thank you, Merlin Cycles. The Groupo by Campy is a real beauty, flawless and light, exceptional quality. I have been a 24 year campy owner, this new version is light, responsive and impeccable quality. Great front shift, 2015 campy mech is on par or better than dura ace. Rear shifting is good but lags behind sram red 22 in speed and feel. Super solid groupset, great bearings, chain, brake levers are super smooth and the cranks are super stiff. Durable and race worthy. You really can't go wrong with dura ace vs red vs chrorus, although I'd spring for record instead of chorus for a race bike. I opted for Chorus for my commute/rain bike for durability and best bang for the buck. Four stars because it could be a little bit lighter and include the front deraileur barrel adjuster (campy includes this adjuster in the shifter part descriptions, and this part is required to set up the front derail. to campy spec). Love campag, feels a bit clunky to start but then once it settles is great. I have record (gen before) on one bike and this feels as good. Crankset super stiff & solid. Smooth operation with very good price. I review many of site from time to time, and Merlin can always provide cheapest and large variety of bike parts. Good services and well done! I honestly think it's better than Shimano Dura Ace. Only great things to say. This gruppo is flawless and it looks great too. I was undecided on whether to get the Chorus or Record and I went with Chorus to save some money. I have Record on my other bike and I can guarantee you that you cannot tell the difference. The only weight gain that could be of a concern is 30gr on the crankset. The other few grams here and there are non rotational mass so they don't really matter (I used a record chain on my Chorus group) If that's worth over $400 then get the Record. Now about Merlin: they are truly great. I'm in the US and have shipped with other UK based internet retailers. This is not the right place to slander other vendors but all I have to say is Merlin is way better. They are very responsive to your inquiries and UPS shipping is the only way to go if you are in the US and want to get your stuff in a timely manner and w/o paying customs. Upgraded from Shimano RXS 7 speed so consider that when I tell you that this gruppo is magical. I love it. The brifters live up to their ergo name. The transitions across gears are superior. Retraining my brain on using the brifters has been crazy but totally worth it. Word of caution for those upgrading: we measured everything when I was selecting this gruppo but I still needed to put a spacer in so the chain didn't drag on the seat stay when in the absolute highest gear. Probably due to the fact that I have a small early 90s Specialized Allez but I can't be the only one who gets weak in the knees over a vintage chromaly bike. Best groupset I've ever ridden. Shifts seem instantaneous and almost effortless, both front and rear. Improvement in the front derailleur is very impressive. Mounted the crankset in less than 10 minutes. Adjusted front and rear derailleurs according to Campagnolo directions. Worked perfectly from the first. After 300 miles I haven't even had to adjust cable tensions. The brakes are powerfull, even and easily modulated (on Hed Belgium rims). As others have noted, the brake lever ergonomics are excellent. I can't come up with a negative or even suggest any improvement. Great groupset! Absolutely stunning in both aesthetics and performance. I cannot rate this groupset highly enough!